Sports Thread’s youth sports-focused social networking platform will bring additional functionality and benefits to Arizona Soccer clubs and athletes. 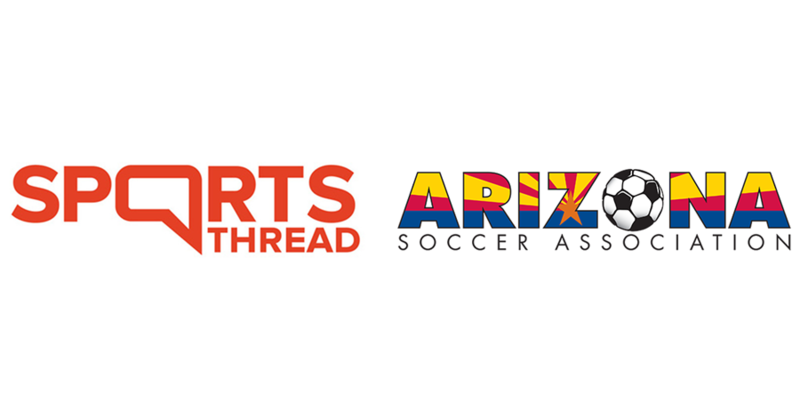 PHOENIX, January 30, 2019 – The Arizona Soccer Association (ASA) announces a partnership with Sports Thread, the leading social media-based network that connects student-athletes to college coaches. Through Sports Thread’s sports social networking platform, student-athletes in Arizona can create profile pages with their biographies, unlimited video highlights, stats, academics, and unique player metrics. Players can share this information with college coaches nationwide and college coaches can review in-depth information on an athlete in real time at tournaments or matches. The student-athletes can be contacted by college coaches through direct messaging on Sports Thread Chat. Team Chat: Athletes, coaches and parents can organize team communications directly through private group chat to organize anything from practice times to game day changes. The Thread: A nationwide platform showcasing content from competitive athletes, college coaches and fans. Athlete Self Promotion: Athletes will be able to use Sports Thread’s 4-Step Self Promotion process to create scholarship opportunities at any NCAA, NAIA, NJCAA and CCCAA college, research colleges and navigate the recruiting process. Sports Thread Push Notifications: ASA will be able to distribute important information through Sports Thread’s push notification infrastructure; players, coaches and fans can be notified right away of any game day issues, such as weather delays.?? Sports Thread, based in Denver, Colorado, offers a social media based, self-promotion, communications and educational platform for the 45 million youth athletes in the United States regardless of their individual skill level, socioeconomic status or geographic location. Tournament, league, club and camp organizations also use Sports Thread to streamline communications between players, coaches, parents, and fans. Founded in 1974 as a non-profit, the Arizona Soccer Association (ASA) is Arizona’s largest soccer association with more than 40,000 registered players. The ASA provides competition through league and tournament player, coaching education courses, and parent education. The ASA hosts Arizona's most prestigious soccer tournaments every year: State Cup, Presidents Cup, and Adult State Cup.